In our previous catechesis, we reflected on the event of the Resurrection of Jesus, in which the women played a special role. Today I would like to reflect on its saving capacity. 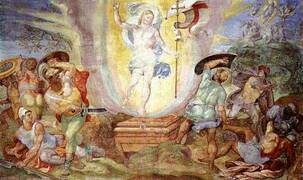 What does the Resurrection mean for our life? And why is our faith in vain without it? Our faith is founded on Christ’s death and Resurrection, just as a house stands on its foundations: if they give way, the whole house collapses. Jesus gave himself on the Cross, taking the burden of our sins upon himself and descending into the abyss of death, then in the Resurrection he triumphed over them, took them away and opened before us the path to rebirth and to a new life. St Peter summed this up at the beginning of his First Letter, as we heard: “Blessed be the God and Father of our Lord Jesus Christ! By his great mercy we have been born anew to a living hope through the Resurrection of Jesus Christ from the dead, and to an inheritance which is imperishable, undefiled, and unfading” (1, 3-4). 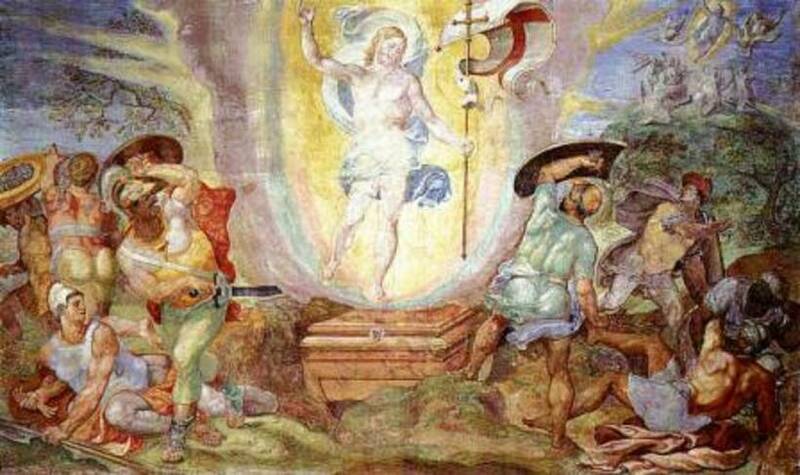 The Apostle tells us that with the Resurrection of Jesus something absolutely new happens: we are set free from the slavery of sin and become children of God; that is, we are born to new life. When is this accomplished for us? In the sacrament of Baptism. In ancient times, it was customarily received through immersion. The person who was to be baptized walked down into the great basin of the Baptistery, stepping out of his clothes, and the Bishop or Priest poured water on his head three times, baptizing him in the name of the Father, of the Son, and of the Holy Spirit. Then the baptized person emerged from the basin and put on a new robe, the white one; in other words, by immersing himself in the death and Resurrection of Christ he was born to new life. He had become a son of God. In his Letter to the Romans St Paul wrote: “you have received the spirit of sonship. When we cry ‘Abba! Father! it is the Spirit himself bearing witness with our spirit that we are children of God” (Rom 8, 15-16). It is the Spirit himself whom we received in Baptism who teaches us, who spurs us to say to God: “Father” or, rather, “Abba!”, which means “papa” or [“dad”]. Our God is like this: he is a dad to us. The Holy Spirit creates within us this new condition as children of God. And this is the greatest gift we have received from the Paschal Mystery of Jesus. Moreover God treats us as children, he understands us, he forgives us, he embraces us, he loves us even when we err. In the Old Testament, the Prophet Isaiah was already affirming that even if a mother could forget her child, God never forgets us at any moment (cf 49, 15). And this is beautiful! Yet this filial relationship with God is not like a treasure that we keep in a corner of our life but must be increased. It must be nourished every day with listening to the word of God, with prayer, with participation in the sacraments, especially Reconciliation and the Eucharist, and with love. We can live as children! And this is our dignity — we have the dignity of children. We should behave as true children! This means that every day we must let Christ transform us and conform us to him; it means striving to live as Christians, endeavouring to follow him in spite of seeing our limitations and weaknesses. The temptation to set God aside in order to put ourselves at the centre is always at the door, and the experience of sin injures our Christian life, our being children of God. For this reason we must have the courage of faith not to allow ourselves to be guided by the mentality that tells us: “God is not necessary, he is not important for you”, and so forth. It is exactly the opposite: only by behaving as children of God, without despairing at our shortcomings, at our sins, only by feeling loved by him will our life be new, enlivened by serenity and joy. God is our strength! God is our hope! Dear brothers and sisters, we must be the first to have this steadfast hope and we must be a visible, clear and radiant sign of it for everyone. The Risen Lord is the hope that never fails, that never disappoints (cf Rom 5, 5). Hope does not let us down — the hope of the Lord! How often in our life do hopes vanish, how often do the expectations we have in our heart come to nothing! Our hope as Christians is strong, safe and sound on this earth, where God has called us to walk, and it is open to eternity because it is founded on God who is always faithful. We must not forget: God is always faithful to us. Being raised with Christ through Baptism, with the gift of faith, an inheritance that is incorruptible, prompts us to seek God’s things more often, to think of him more often and to pray to him more. Being Christian is not just obeying orders but means being in Christ, thinking like Him, acting like Him, loving like Him; it means letting Him take possession of our life and change it, transform it and free it from the darkness of evil and sin. Dear brothers and sisters, let us point out the Risen Christ to those who ask us to account for the hope that is in us (cf 1 Pet 3, 15). Let us point him out with the proclamation of the word, but above all with our lives as people who have been raised. Let us show the joy of being children of God, the freedom that living in Christ gives us which is true freedom, the freedom that saves us from the slavery of evil, of sin and of death! Looking at the heavenly homeland, we shall receive new light and fresh strength, both in our commitment and in our daily efforts. This is a precious service that we must give to this world of ours which all too often no longer succeeds in raising its gaze on high, no longer succeeds in raising its gaze to God." Je salue avec joie les pèlerins francophones, en particulier les prêtres de l’archidiocèse de Bordeaux accompagnés par le Cardinal Jean-Pierre Ricard et son Auxiliaire, ainsi que tous les jeunes ! Notre espérance est fondée sur Dieu, qui est toujours fidèle. Il est toujours fidèle ! Elle est forte, sûre, solide. Devenez-en les signes visibles pour notre monde souvent incapable de lever les yeux vers Dieu. Bon pèlerinage ! I am pleased to greet the visitors from the NATO Defense College and I offer prayerful good wishes for their service to international peace and cooperation. I also extend a warm welcome to the group of “Wounded Warriors” from the United States, with heartfelt prayers that their pilgrimage to Rome will bear rich spiritual fruit for them and their families. Upon all the English-speaking visitors present at today’s Audience, including those from England, Scotland, Denmark, Australia, the Philippines, South Korea, Thailand, Canada and the United States, I invoke the Risen Lord’s gifts of joy and peace. Sehr herzlich grüße ich die Pilger deutscher Sprache, vor allem die vielen jungen Freunde, insbesondere die Schulgruppen aus Münster und Dießen. Vielen Dank auch für die Musik. Christus ist gestorben und auferstanden, um uns zu Kindern Gottes zu machen. Wir wollen den Menschen um uns die Freude, Gottes Kinder zu sein, weiterschenken. Wenn wir in Christus leben, dann sind wir wirklich frei und erhalten Kraft für die Mühen des Alltags. Der Herr segne euch alle. Saludo cordialmente a los peregrinos de lengua española, provenientes de España, Argentina, México y los demás países latinoamericanos. En particular, al grupo de las diócesis de Galicia, con sus Obispos, así como a los sacerdotes del curso de actualización del Pontificio Colegio Español, y al grupo del Club Atlético San Lorenzo de Almagro, de Buenos Aires: esto es muy importante. Invito a todos a dar testimonio del gozo de ser hijos de Dios, de la libertad que da el vivir en Cristo, que es la verdadera libertad. Muchas gracias. Saúdo cordialmente os peregrinos de língua portuguesa, em particular os grupos vindos de Coimbra e de São José do Rio Preto. A todos agradeço pela presença, desejando a cada um que possa crescer sempre mais na vida nova de ressuscitados que Cristo nos conquistou. Que Deus vos abençoe! الأخوات والإخوة الأحباء الناطقون باللغة العربية: إن قيامة المسيح هي اليقين الذي يجب أن نبني فوقه وجودنا وسلوكنا اليومي. فلا تيأسوا أمام الشر والموت، وتذكروا دائما أن المسيح قد أكد لنا: "قلت لكم هذه الأشياء ليكون لكم في السلام. ستعانون الشدة في العالم ولكن ثقوا فإني قد غلبت العالم". وليحل عليكم جميعا سلام الرب القائم من بين الأموات! Serdecznie pozdrawiam uczestniczących w tej audiencji Polaków. Przedwczoraj obchodziliśmy uroczystość Zwiastowania Pańskiego, pamiątkę dnia, w którym Chrystus, Syn Boży zstąpił z nieba, przyjął ciało z Maryi Dziewicy i stał się człowiekiem. To wydarzenie wspominamy w codziennej modlitwie, gdy pozdrawiamy Bożą Matkę słowami Anioła: „Zdrowaś Maryjo, łaski pełna”. Uczmy się od Niej pokory, rozpoznawania woli Bożej, posłuszeństwa i zawierzenia Bogu. Z serca wam błogosławię. Rivolgo un cordiale benvenuto ai pellegrini di lingua italiana. In particolare saluto i fedeli delle Diocesi di Grosseto, Livorno e Teggiano Policastro, accompagnati dai Vescovi, Mons. Borghetti, Mons. Giusti e Mons. De Luca, venuti per il pellegrinaggio alla Sede di Pietro in occasione dell’Anno della fede. Saluto il gruppo di dipendenti dell’IDI. Auspico che quanto prima si possa trovare una positiva soluzione in una situazione così difficile. Saluto i membri della Società Italiana di Radiologia Medica nel centenario della fondazione, i devoti della Madonna della Sciàrra, Santuario dell’Arcidiocesi di Catania e i fedeli del Movimento mariano di Bagherìa. La visita alle tombe degli Apostoli rafforzi in tutti la fede, la speranza e la carità. Infine, un pensiero affettuoso ai giovani, ai malati e agli sposi novelli. Lunedì scorso abbiamo celebrato la Solennità dell’Annunciazione: la Vergine Maria ispiri la vostra mente, cari giovani, perché sappiate sempre ascoltare e mettere in pratica la volontà del Signore; riscaldi i vostri cuori, cari ammalati, nell’offrire la vostra sofferenza per il bene della Chiesa; e guidi voi, cari sposi novelli, a riconoscere la presenza di Dio e del suo amore nella vostra nuova vita familiare. Ho appreso la notizia del forte terremoto che ha colpito il sud dell’Iran e che ha causato morti, numerosi feriti e gravi danni. Prego per le vittime ed esprimo la mia vicinanza alle popolazioni colpite da questa calamità. Preghiamo per tutti questi fratelli e sorelle dell'Iran."